With our “Select Your Day” service included free as standard, you won’t be left wondering when your order will arrive. Simply select the exact day you wish your order to arrive at the final checkout stage, and we will schedule it for then. Only the delivery dates available will be shown – it’s that simple. Standard delivery days are Monday to Friday and you can select your day from as early as 3 working days after your order, or up to three weeks in advance. Being a standard pallet delivery service, your order will arrive some time between the hours of 9am – 6pm on your chosen day and we are not able to provide an estimated time of arrival, although drivers often call ahead to state they are on their way – please ensure the phone number you enter is the best number for the driver to contact you on. We recommend someone be available all day to receive the delivery, however the driver will leave your order somewhere safe where possible if no-one is present. We put your order together in our warehouse on a pallet, place a rain cover on top and then a full wrap to protect it from the elements and to ensure a safe delivery. Once wrapped we arrange for the nationwide pallet distribution network TPN (The Pallet Network) to collect from us and deliver to your property using a local member near to your. Important – please read the below section carefully. It is important to understand the limitations involved in delivering our goods and charges may apply in cases were drivers are unable to deliver. Under normal circumstances your order will be delivered on an 18t vehicle with a tail-lift similar to the truck pictured at the top of this page – the driver will unload your order with a pallet pump truck and place it where you request where possible. The vehicle requires clearances of 3M (10ft) in width and 5m (17ft) in height to access your property (this includes overhanging branches etc). If you have an extremely narrow road or difficult access, we recommend calling us beforehand to check if we can deliver to your home. We will be honest and recommend not ordering if we believe your delivery could be problematic. Under no circumstances can we deliver if the vehicle has to park on an incline/decline or hill to off-load – as the goods weigh between 300-950kg, it is impossible to push/pull and unload the pallet off the vehicle due to the increased forces and safety risks involved; the vehicle must be able to park on a flat surface or road to perform a successful delivery. Is a signature required – do I need to be there for delivery? We understand if you’re not able to be there for delivery, therefore it’s not a requirement. By default, if no-one is present the driver will leave your order in a safe place where possible. The pallet delivery members nor ourselves could be liable should anything happen to your order after delivery. Delivery is free to the overwhelming majority of UK postcodes – only a select few areas such as the Isle of Man, the Channel Islands, the Isle of Wight, the Isles of Scilly, Wales, Ireland, and some remote areas of Scotland such as the Highlands. Some central London postcodes carry a small surcharge – any surcharges will be applied automatically at the checkout process before payment. Should anything go wrong with your delivery, please contact us straight away by e-mail or phone (0800 915 5416) and we’ll do all we can to provide a solution that’s 100% to your satisfaction. 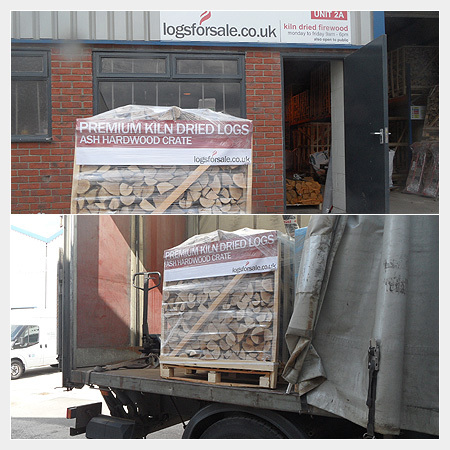 We’re here with an aim to provide the easiest, most safest and efficient way of providing customers in the UK with firewood that’s consistent – we are here to support you before, during and after your purchase.